Our pets are our family, and that means they should always be treated as such. So if you’re about to get a pet, you need to think about what that means and the sacrifices you need to make, particularly for active dogs. Some people don’t think about the yard when it comes to pet shopping, but it’s such an important thing to any dog that you want to have outside. 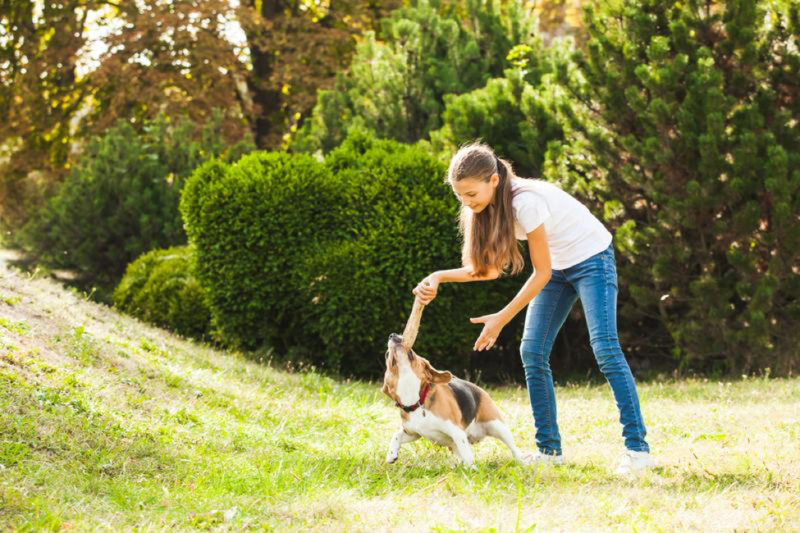 When you are preparing your backyard for your pet, it is good to take some of the below precautions for a pet-friendly yard. Did you know that there are a number of plants that are poisonous to dogs and cats? Educate yourself on this matter by checking out this list of harmful plants from the ASPCA. Be mindful of what your backyard currently has, and what you will add in the future. Having a fence in general is a good idea if you own a pet. It makes trading easier and gives your pet a place to play freely. Vinyl fences are usually the best option for pets because they are soft, non-abrasive, don’t need yearly painting or frequent cleanings, all while being strong enough to keep in your pet. That being said, if you feel like your dog won’t be contained with a simple vinyl fence, look into more options including chain link or tall wood fences or repair or reinforce existing fencing with sturdy materials such as bailing wire. If your yard is sprayed with pesticides or other lawn care products, you’ll want to make sure they are natural. If ingested, these chemicals may cause harm or a threat to your pet’s health and well-being. If your yard is wide open, it is best to purchase a dog house that will provide shelter/shade for your dog on a sunny or rainy day. If you have a cat, you may want to find something similar. It’s important to have comfortable and safe spaces for your furry friend. If you fail to provide one, it could even be considered neglect. Grass is best, but if you have gravel or a walkway, be sure that the surface isn’t too hot or sharp for your pet’s paws. If your pet will be outdoors often, it is best to fill up a water bowl daily and leave in a shady spot of the yard. Staying hydrated is very important for everyone, even your furry friend. Be sure to maintain the grass in your yard to prevent your pet being bit by a tick. The taller the grass, the easier it is for ticks to latch on. Also, you don’t want any dogs to get into the bad habit of treating your yard as a toilet because of the hiding potential of your tall grass. And you definitely don’t want other people’s dogs doing the same thing. If applicable, make sure the pool area is closed off by a fence. Most dogs can swim, and cats might not like the water, but that doesn’t mean that accidents don’t happen and that having that space open could cause them harm. Additionally, you usually want to keep your pool water clean, and unless your pet is squeaky clean at the moment of frolicking around your yard, you should keep them away. Be mindful of the above, and your yard will be a safe space for your pet to roam, play, and enjoy the weather.